Chinese Acupuncture: Sterile, disposable, hair-thin needles inserted at specific locations throughout the body to resolve imbalances and restore health. 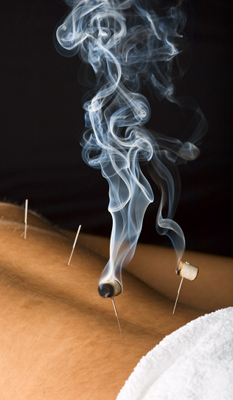 Moxabustion: Special herbs are burned at various points on the body, either on the head of the needle or with a moxa pole, to further stimulate and support the energy in that area. Electro-acupuncture: Small electrodes are attached to acupuncture needles to provide gentle stimulation to particular acupuncture points (similar to a TENS machine). Gua Sha: A therapeutic massage technique using a Chinese soup spoon that is strongly stimulating and moving. Gua Sha is particularly helpful to relieve tension in tight muscles. Cupping: Another powerful technique to address stubborn pain conditions, similar to those addressed by Gua Sha. Chinese Herbal Medicine: Individualized herbal prescriptions are created for each patient to address their unique health makeup.